“Make schnitz, not war!” I guess in our case it was “make schnitz, make friends!” As you may you know I had the pleasure to meet Molly and Greg, 2 super Schnitzel VIP, couple weeks ago at the Vendy. Since then we had met up 1 more time when Andrew Zimmern visited the Schnitzel truck. Then Molly had an idea where all 3 of us should find a place to eat and all 3 of us blog about it. As we were discussing this over the interweb (Twitter) Mr.Schnitzel invited himself along, hahahaaa. 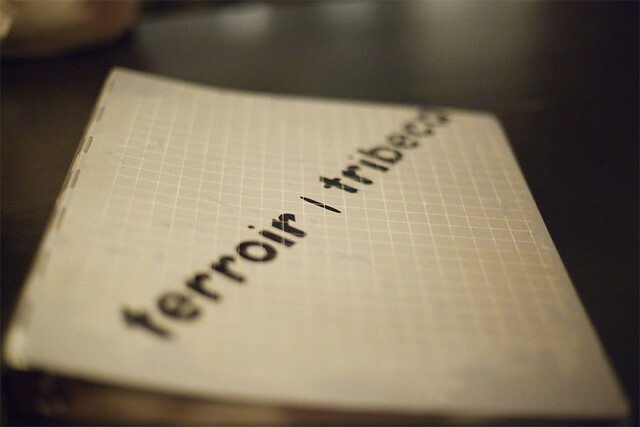 After a good while of going back and forth we finally settled on Terroir in Tribeca. Of course I was late. First I left work later than I wanted to, took forever for the 1 train to arrive and it had to go express and skipped my stop and I walked the wrong direction. Weeeeeeeeeeeeee… Everyone was standing outside waiting for me when I arrived. We walked into a pretty packed place but lucky for us there was a whole table empty just for us. 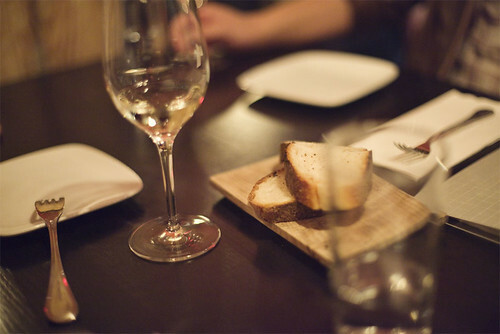 Terroir is a wine bar that does tapas. Obviously we started off with a bottle of…I think it was a riesling. I’m not very good at picking what wine to drink and we all let Greg do the picking. 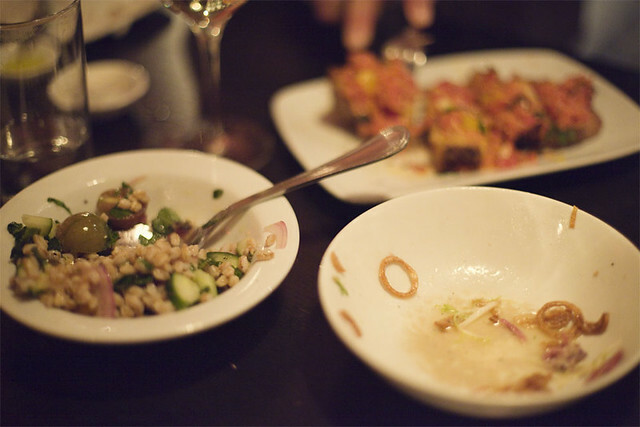 At Terroir they have something similar to an omakase, where they will serve you whatever food they wanted. We all liked the idea since none of us wanted to think. We just wanted to eat and drink. 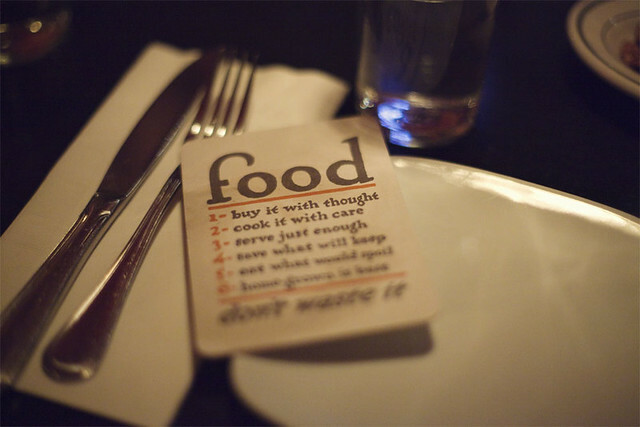 Like Molly said, in this city its easy to find great meals but it takes so much more to find great meal experiences. It all depends on the atmosphere, the conversations, the mood, your mood, my mood, the surroundings…etc. 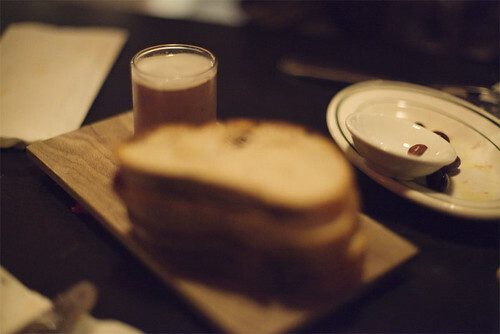 It was nice to have a meal and drinks with people that loves food, maybe even loves food more than I do. It was nice to actually see Oleg and Hannah outside of the truck. Here’s what we ate. 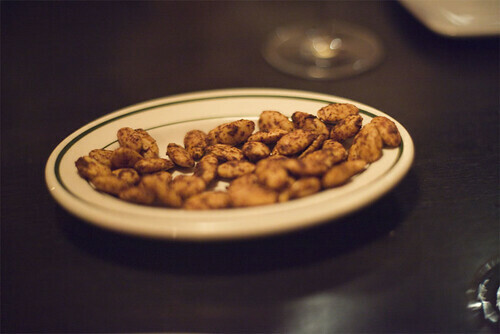 First off we started off with a plate of smoked almonds. They were pretty damn good but I wouldn’t have been able to tell if they were smoked or not. Does duck confit and frisee go together THAT well? 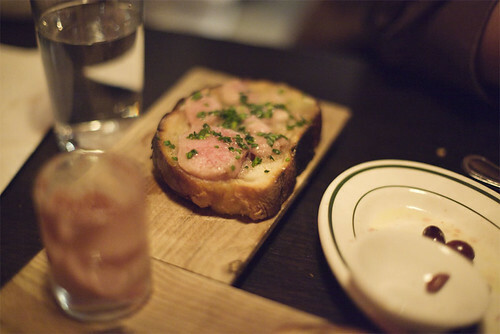 The only time that I have duck confit is at Balthazar and they serve it with frisee as well. 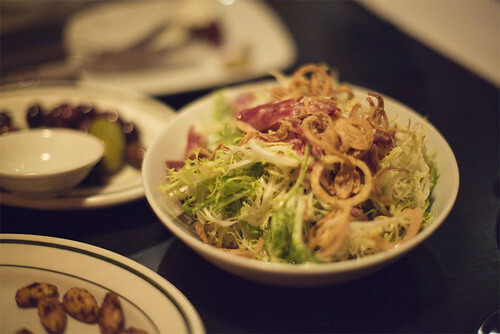 Terroir’s frisee, crispy duck confit, gorgonzola with fried shallots was pretty good. There were more frisee and shallots than anything else. The farro with summer veggies and herbs was a good light salad but for some reason that was the only thing we didn’t finish off. A 3rd salad that we got was the dandelion greens, hard boiled egg, garlic and bread crumbs. I didn’t really care much for this salad maybe because I wanted some meat. 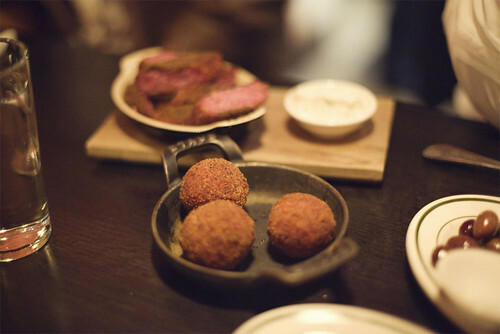 The beet, gorgonzola risotto balls were fantastic. Great little fried bites. What I thought were strips of steaks were actually sage leaves with lamb sausage. It wasn’t too lamby and thats the way I like my lamb. 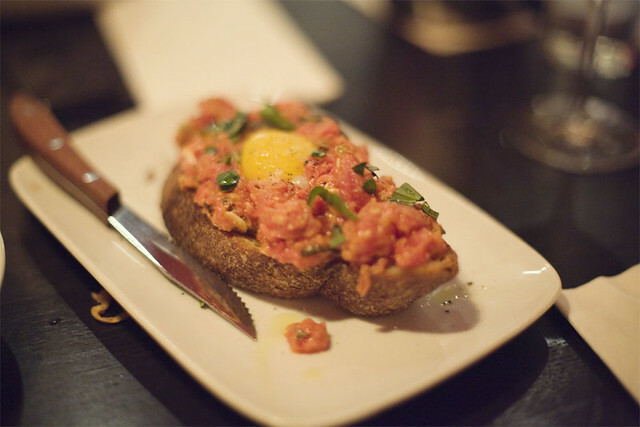 We got 3 bruschetta, tomato, basil and egg, chicken liver and bone marrow with garlic chives. All 3 were oh so good. The tomato, basil and egg was total comfort food for me. I wouldn’t mind eating a whole bowl of that over rice. The flavors of the chicken liver were spot on. We attacked the bone marrow, I’m tempted to make it at home. 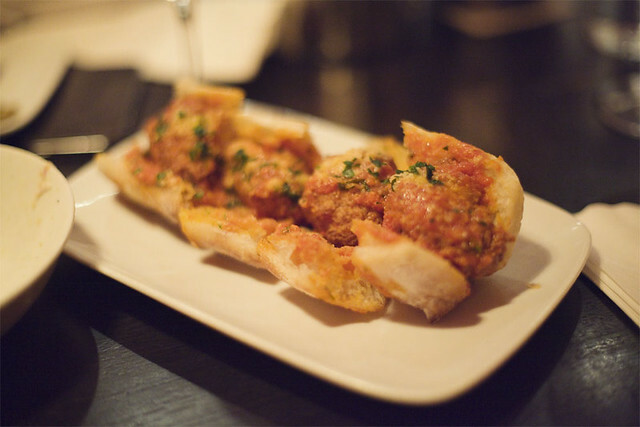 The meatball sandwich was crazy good. It was light and not dry at all. 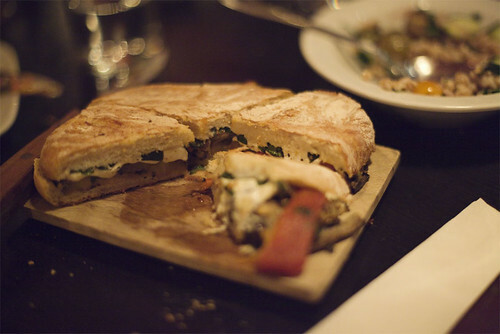 The eggplant, red pepper, basil and mozzarella was good but nothing special. Though I did think it was a meat sandwich but oh what? it’s actually eeegggplant. Yeah just realized it right now as I’m staring at the menu. Terroir good job for tricking me into eating eggplant. Towards the end of the meal while Oleg and Hannah were outside smoking Greg informed the waiter that it was Oleg’s birthday, hmm.. 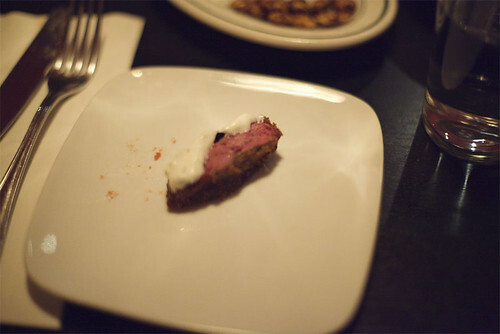 It was fun to see Oleg’s expression when a tiny chocolate mousse topped with hazelnut and a candle came to our table.